chipPad IS ON SALE! ONE OF THE VERY FIRST iPad MUSIC APPS IS NOW 66% OFF UNTIL 2012! HAPPY HOLIDAYS TO ALL! chipPad is a multi-track sample and loop playback and performance application. It is made for the musician who creates loop-based music and is looking to experiment with on-the-fly arrangements or to glitch it up a notch. This application does not make music for you – you need to provide the clips that you create with your other instruments. 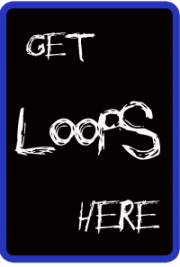 By adding your own pre-cut loops on up to 8 tracks you can perform using various “grid-based” controller techniques and develop new ones that are only capable on a multi-touch device. Sliding one or multiple fingers back and forth on various tracks or tapping rhythms like on a drum machine can yield some amazing results you can’t hear elsewhere. chipPad comes with a few sample sessions to get you started. Simply select Help from the Gear menu to get started or load your own AIF or WAV audio files into the app using File Sharing via iTunes. ChipPad is available for $0.99 for a limited time.